Totem, written and directed by Quebecer Robert Lepage, does not disappoint. When we were a wee Torontoist lass, growing up in the suburbs of this fair city, the big ticket in town was the annual Shriners Circus. So this week, when we approached the blue-and-yellow big top for our first ever Cirque du Soleil show, we’d like to say that our inner child was just bursting with excitement—but really, that’s just how excited we still are as adults. Let’s just say the production values have improved dramatically compared to our childhood circus memories. 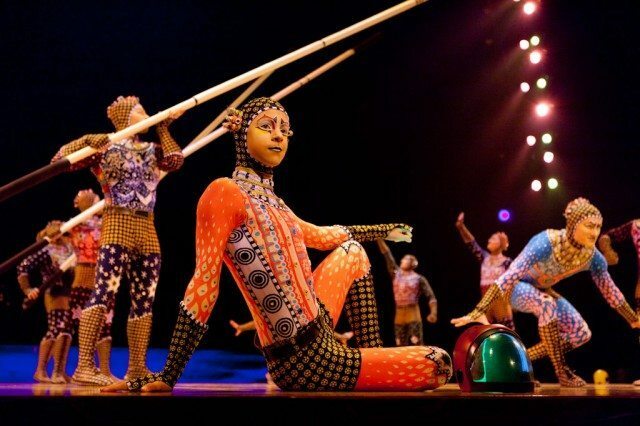 Cirque’s latest show explores the evolution of mankind, with everything from a First Nations hoop dancer to acrobats in amphibian attire to the requisite (but gracefully executed) ape-to-caveman-to-businessman line-up. Even science is glamorized! With the help of his monkey assistant, a Darwinesque scientist tinkers with beakers full of fluorescent liquids, then steps inside a cone-shaped chamber to juggle glowing balls that, according to the show’s description, could represent either planets or molecules. The show doesn’t follow one continuous storyline, but there are enough recurring characters and themes to give it a proper cohesive feel. As well as the aforementioned Native American dancers and the Darwin figure, we see cultures from all over the globe represented—Bollywood music, Australian didgeridoo sounds, colourful costumes inspired by ancient Mayan drawings, and even a gabby Italian clown. One of the most awe-inspiring parts of Totem, though, is the set, which transforms itself throughout the show. Performers enter the stage through a tall thicket of reeds, and before them, depending on the scene, lies a lake, an active volcano, or a sunny beach with waves lapping at the shore. These active landscapes are projected onto the ground using footage shot on location in places such as Iceland, Hawaii, and Guatemala. For images of the night sky, Cirque du Soleil founder Guy Laliberté literally travelled into outer space (as part of a mission to promote his water conservation charity, One Drop). So, yeah. They’re not skimping on production values. But all of this high-concept imagery and metaphor-laden juggling doesn’t mean that you can’t just sit back and enjoy the pure, unadulterated, sparkly goodness of the circus. Because for every cocktail dress–wearing VIP enjoying Cirque’s cushy Tapis Rouge lounge, there’s a bearded father stuffing a too-large handful of popcorn into his young son’s mouth. And under the big top, both are equally impressed by the human disco ball lowering from the ceiling, glittering as the spotlight catches the thousands of tiny mirrors attached to his costume. Ask the show’s creators, and they’ll tell you he represents the life force. But to us, he’s still a pretty, shiny human disco ball who can contort his body much more impressively than we can.